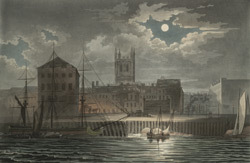 Situated at the mouth of the River Hull, the town had developed as a port in medieval times, with a particular emphasis on the export of local wool. By the late 18th century the population was growing, trade with the Baltic was strong and wealthy merchants were rebuilding their timber houses and replacing them with fashionable brick terraced houses. Many merchants built their houses fronting along the High Street with their backs out on to the private wharfs (or staithes) on the river.